Back cover blurb: Why would someone want to murder the father he never knew? After Peter Körber is stabbed to death in Berlin, his son, Andreas, leaves Denmark, where he was raised by his mother and stepfather, and travels to that once-divided city to uncover the brutal truth. In his search to know this complete stranger, Andreas hopes to come to grips with his own identity crisis, stalled academic career, and failed relationship. But what kind of man was his father? A complicated portrait begins to emerge concerning Peter’s role in the German Democratic Republic before reunification. As Andreas struggles to find a chink in the wall of secrets and lies that obscures the real Peter Körber, he brings to light disturbing revelations that open fresh wounds and have devastating consequences. Gripping and profoundly moving, The Wall Between is a haunting novel of the harsh realities of living under a repressive regime, the price of blind allegiance to ideology, and the moral complexity of personal culpability. 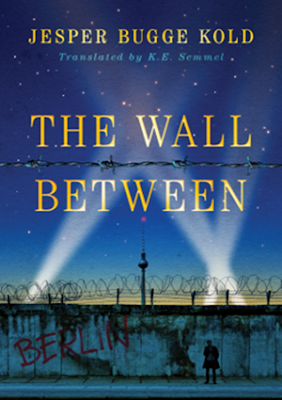 The Wall Between is the first novel I've read that features the falling of the Berlin Wall and life in Germany before the fall. In it we meet Andreas, a son searching for and trying to get to know his father following his death. Andreas' father is former Stasi officer and Andreas is forced to search for answers from people whose lives in East Berlin have led them to be cautious or even fearful of the truth. They do not want to answer Andreas' questions, but he is desperate to know the truth. The wall between offers us three differing perspectives, those of Peter; the deceased Stasi officer, his illegitimate son; Andreas and one of his 'victims'. But rather than damning the DDR State Sicherheit, this novel lets us draw our own conclusions as we given the perspectives of those living through the troubled and difficult periods. It is a clever and thought provoking novel and one that should be considered by anyone looking for something a little different to read. The Wall Between is available now via Amazon online.